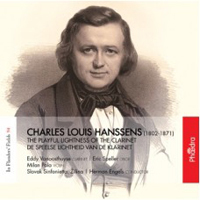 CHARLES LOUIS HANSSENS (1802-1871): Concertinos for Clarinet and Orchestra No. 1 in E Flat and No. 2 in C, Solo de clarinette with Orchestra, Fantaisie in B Flat for Violin, Clarinet and Orchestra, Morceau de concert for Oboe, Clarinet and Orchestra. Description: Hanssens was a cellist but, as you can see, he liked the clarinet too. All five works here date from 1836-1843; the Fantaisie has affiliations with the Germanic early Romanticism of Weber and Spohr while the rest are more playful and light-hearted. Eddy Vanoosthuyse (clarinet), Eric Speller (oboe), Milan Pala (violin), Slovak Sinfonietta, Žilinal; Herman Engels.